Served by Blue Springs R-IV, Grandview C-4, Hillman Mills C-1, Lee’s Summit R-VII and Raymore Peculiar R-II, the remarkable city of Lee’s Summit, Missouri is a wonderful place to buy a home and raise a family. This amazing suburb in the Kansas City metropolitan area has been named one of the “Top 10 Happiest Places” in Missouri and with all of its wonderful features and nearby attractions, it is easy to understand why. Composed of 65.87 square miles, Lee’s Summit is located in both Jackson and Cass counties, southeast of Kansas City. 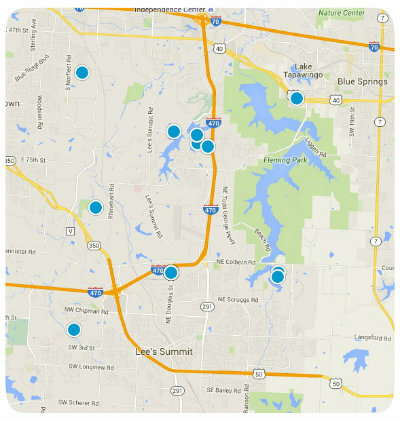 Convenient access to major arteries like U.S. 50, M-291, M-150 and I-470 make travel easy for Lee’s Summit residents. Within minutes, Lee’s Summit residents can experience the best dining, shopping, entertainment and recreation the K.C. metro area has to offer. It is no wonder this beautiful city is so popular among prospective homebuyers. Lee’s Summit real estate is impressive and diverse and comes nestled in a wide range of neighborhoods and subdivisions including gated, golf, master-planned and lakefront communities. One of Lee’s Summit’s most remarkable communities is that known as Woodland Shores. Woodland Shores is a gorgeous community of luxury lake homes with unique architecture and highly sought after privacy. With picturesque rolling parkland and excellent share amenities, including a swimming pool and boat dock, Woodland Shores is a must-see destination for everyone considering relocation in the K.C. metro area. There are scenic walking and biking trails throughout the community and numerous glistening lakes boasting opportunities for fishing, pontoon boating and swimming. In close proximity to the amazing homes of Woodland Shores you’ll find Lake Jacomo, Prairie Lee Lake, Fleming Park and Legacy Park, all boasting recreation options and opportunities for enjoying the area’s natural beauty. Homes in Woodland Shores start around $350,000 and vary in price depending upon the property’s age, size, location, architectural style and special features. All homes in Woodland Shores are custom built by top-notch builders in Lee’s Summit. The home designs are upscale and yet relaxed and welcoming. Not only are the Woodland Shores homes luxurious and beautiful, but the landscaping in the community is exquisite as well. The tree-filled neighborhood has abundant flower beds, stone walls, and well manicured shrubs all maintained to match the undeniable natural beauty of the area. If you would like to buy a home in the breathtaking community of Woodland Shores, or if you have questions regarding homes for sale in other Lee’s Summit, Missouri communities, please do not hesitate to contact us today for more information.